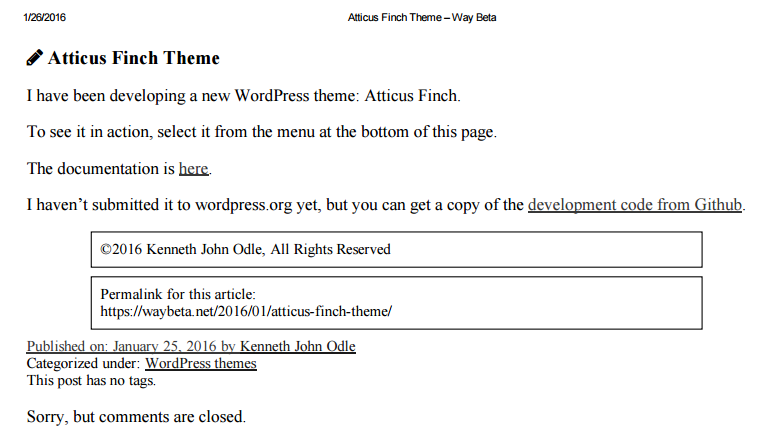 This page describes the theme options available for the Atticus Finch WordPress theme, version 0.3. You can choose whether to display titles for the above post formats. 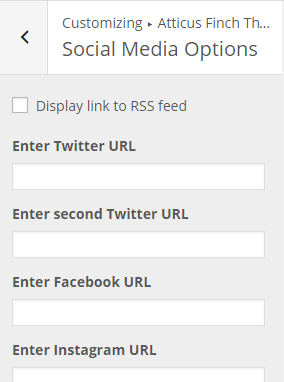 The options are checkboxes, meaning that you can enable the option for one, some, or all post formats. 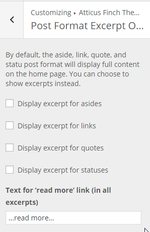 This option affects these post formats in all locations: home page, archive pages, and individual posts. By default, Atticus Finch displays post excerpts on the home page and in archive pages. 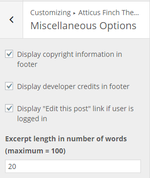 However, because asides, links, quotes, and statuses tend to be shorter, you can choose whether to display excerpts for full content for the above post formats on the home page and on archive pages. In this way, if one of these posts is slightly longer than the default excerpt length, it will still display in its entirety. You can also select the text to use for the "Read More" link. The default is "…read more…". Note: This will affect all post formats, not just the four listed above. Information about widget areas is here. Atticus Finch supports both custom header and custom background images, although it does not ship with them. Currently, Atticus Finch recommends a custom header image of 1000 x 250 pixels. However, because the header of the theme extends the entire width of the screen, it is probably better to not use a header image. Any size background image may be used. However, Atticus Finch does not currently support full-size background images, so use a tileable image. Ticking the box marked "Print URL information at end of post" will display the URL of the document in a bordered paragraph on the last page of the document. See the sample below. Ticking the box marked "Print copyright information at end of post" will display the contents of the "Copyright Information" option in a bordered paragraph on the last page of the document. See the sample below. The option "Copyright Information" provides a place to include your copyright information. You can include any combination of text and HTML. Note: This information will appear in the footer of all pages. 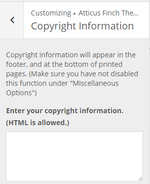 However, you must also tick the box labeled "Display copyright information in footer" under "Miscellaneous Options". Note: At the present moment, you must enter the complete URL for each profile. 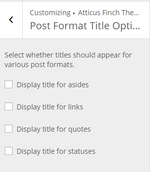 Early versions of Atticus Finch included a custom CSS options; however this has been deleted since it is now a part of WordPress core. Atticus Finch also has a number of miscellaneous options. If you have entered your copyright information in the "Copyright Information" option, tick this box to make it appear on the bottom of each page. This option allows you to toggle showing your copyright information without having to delete it from the "Copyright Information" option. Unticking this box hides the "Powered by WordPress and the Atticus Finch Theme" message in the footer of each page. Ticking this box displays a link to edit posts on the front end of your blog for logged in users who have the ability to edit posts. Use this option to change the length of excerpts. The default is 20; the maximum accepted value is 100. If you edit a value larger than 100, it will revert to 100 upon saving. Atticus Finch has a lot of options available right out of the box. If you want additional options, or to customize the theme's appearance, you'll need to use a child theme. Fortunately, Atticus Finch has a child theme already available. See Atticus Finch Child Theme for instructions on how to download and use it. This page was last edited on 11 June 2017, at 13:02.